Parking.com offers convenient parking for the One Liberty Observation Deck. View the map shown for more information on all parking options, including rates, hours of operations, and entrances. Pre-purchase and discount parking is available at select locations. One Liberty Observation Deck, also known as "Philly from the Top," is Philadelphia's newest public observation deck. Located on the 57th floor of One Liberty Place in downtown, the observation deck is Philadelphia's answer to New York's Empire State Building, offering 360-degree uninterrupted views of Philadelphia and its neighboring states. 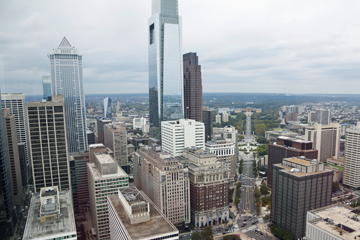 The enclosed observation deck is open year-round from 10 AM - 10 PM for visitors to climb up 883 feet via a state-of-the-art elevator and experience sweeping views of City Hall, the Ben Franklin Parkway, Ben Franklin Bridge, stadium complex, and University City. Touch screen monitors are displayed throughout the deck to give visitors a high-definition look at noteworthy sites around the region, and to receive valuable information about the neighborhood's history, architecture, and culture.